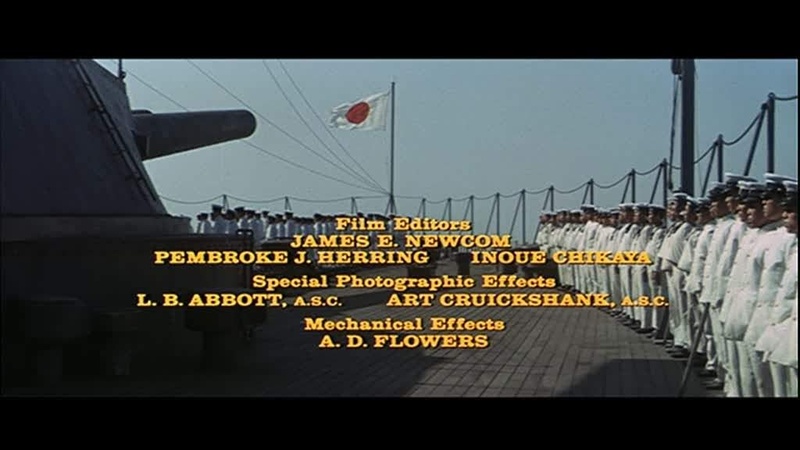 Tora Tora Tora stands out as a prime example of the art of model ships in the cinema due largely to the scale of the the work undertaken and of the ship models themselves. The visual Effects were supervised by LB Abbott and cost, in 1970, $1.25 million. The model shoot was staged and filmed in 20th Century Fox's Sersen tank and took about 40 days to complete. The 20th Century Fox miniatures department supervised by Ivan Martin and Gail Brown constructed 19 Japanese ships and 10 American ships. The ship hulls were made from fiberglass from molds made of plaster. The shape of the Japanese and American hulls turned out to be roughly similar so only a relatively few masters were made. 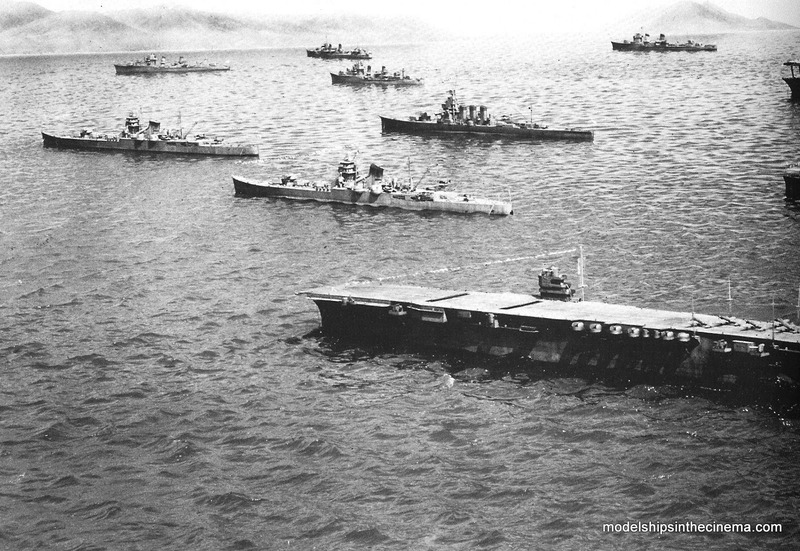 The foreground Japanese ships were built at 1/24 scale and the American ships at a larger scale of 1/16. It was decided that as the American ships were almost all to be blown up, the explosions would look more believable at the larger scale. The sequence of the Japanese fleet making their way across the Pacific used smaller scale models in the background to make them look further away. All the superstructures were built individually from wood, metal and plastic. The details up close are generally quite crude but in the scope of the film this is not visible. Generally in movie making you don't waste time and money on anything that won't ever be seen. The largest of the models was over 40 feet and they ranged down to about 12 feet for a harbour tug. The models were powered by Golf cart engines, though during the storm sequence they had to be augmented by underwater cables attached to winches to overcome the force of the wind and waves generated. Up to 4 ships could be attached to the same cable so that they kept station as they traversed the tank. The depth of the Sersen tank allowed for 3 feet of water. This was designed in the days when waders were the optimum wear for tank technicians. With the development of wetsuits it was decided to add an extra foot of depth to 4 feet for the Tora shoot. A hinged false weir was attached over the original overflow to increase the depth. Blue vegetable dye was added to the water to help hide all the underwater rigging and detergent was added to produce the white water in the storm sequence. To create the wind and surface wave effects six massive converted aircraft fans along with four large truck mounted fans and 15 wind machine fans were strategically placed around the tank. Fog was created with a mix of black and white smoke pots as well as oil based smoke machines. The torpedoes were simulated by a cable that pulled a compressed air nozzle and hose along under water leaving a trail of bubbles. 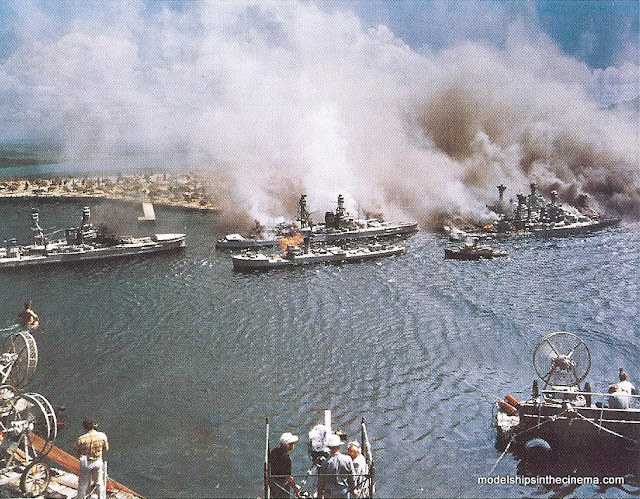 The water spouts caused by the torpedo detonations was created by small charges, just below the surface, blowing gypsum powder into the air to simulate fine water spray. The gypsum looked good on its way up but tended to hang in the air too long for falling water but the shot cuts before that becomes apparent. The production purchased a Photosonics camera capable of 360 frames a second or fifteen times normal speed, which was used used for all the model shooting though not always at the top speed. The shooting was generally around 5 times faster except for some of the explosions which were shot at the top speed revealing multiple rolling flashes within a single blast. The Arizona model was fitted with a release mechanism that allowed the mast to fall to an angle of 40 degrees. The Oklahoma model was attached to a rig that enabled it to roll 180 degrees over. The depth of the tank however would not allow this to happen in one shot so the ship rolled as far as possible, the shot cuts away and then cuts back for the full turtle. Between cuts the superstructure was removed to get the final part of the capsize. The storm sequence was shot during completely sunny weather when they wanted overcast skies. Conversely the attack on Pearl Harbour required Sunshine but the days were overcast. L.B. Abbott said the low contrast light really helped to show up the bright red of the explosions and fire, which is readily apparent in the footage. There was a lot of miniature footage shot that unfortunately was trimmed from the final cut in order to keep the running time of the movie under control. In the future I will have a brief look at the life of the models subsequent to the release of the movie. Source; Special Effects - Wire tape and Rubber Band Style by L. B. Abbott The ASC Press 1984. What a fantastic blog post about an awesome film, thank you! Just to nitpick, but could the behind-the-scenes images be larger please? There are many I've not seen before (and I have both Abbott's Wire, Tape etc. and the ASC Treasury). As always, I congratulate you on fine work and research in this exciting field. THE BEDFORD INCIDENT remains my all time fave Cold War thriller, bar none. Riveting from start to finish.....and what a finish!!!! A masterpiece in every respect. Wally Veevers supervised the model effects, with long time Shepperton fx technicians such as Bob Cuff and Peter Harman also involved. I have a couple of behind the scenes pics of the models in my huge Shepperton Studios special effects retrospective on my blog. Excellent work here too on your TORA blog. Another terrific film that's as good today as it was when I first saw it in 70mm back in 1970. Wonderful model work, especially the night storm shots at sea, however it was the full scale on set physical effects by A.D Flowers that really stole the show for me. Shattering, terrifying (think blown up P40 with runaway propellor almost killing stuntmen on airfield attack sequence...OMG!! Still makes my hair stand on end that one after 30 viewings over the years). Terrific score by Jerry Goldsmith too - and like you, I'd love to see the deleted scenes and extra miniature footage. Unfortunately the photos you mention are from the stills on the special features of the DVD and they are made that small. They don't even fill a normal frame, they are displayed on a background at that ridiculously small size. Thanks for the encouragement. If I could manage to achieve but a quarter of the depth of knowledge, detailed research and enthusiasm you manage to convey on your site I would be very happy. Thank you for such a wonderful blog! Love the old days of movie making with models, matte paintings and all the other handmade FX. In 1972 or 1973 20the Century Fox studios held an auction. Among the props sold were some of the replica Japanese airplanes (heavily modified US aircraft made to look like Zeros and Zekes) and some of the model ships created for TORA TORA TORA. I was 15 at the time and I was amazed at the size and the detail of those ships. I wanted one so badly but my mother reminded me that it was the buyers responsibility to remove them from the studio and that her 1968 Mustang was incapable of towing a 30' Japanese aircraft carrier. I wonder who bought them and where they are now. I love this! 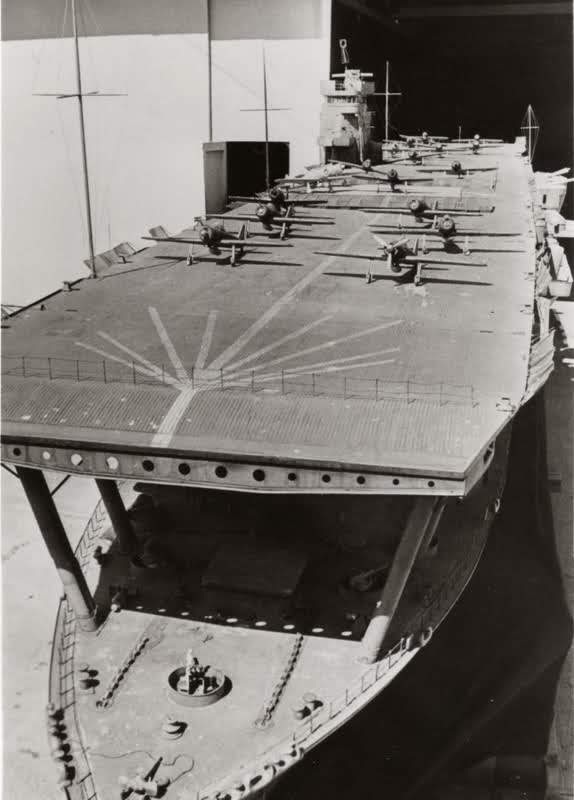 I remember seeing a report on TV about the Fox sale @Dave Hood and one of the pictures here confirms what I remember, the reporter standing on an aircraft carrier model. Great pictures and site! Hate to nitpick, but the Arizona did not capsize, the Oklahoma did. Thanks for spotting the error, I have corrected the mistake in the text. do have anymore info as to the locations or fate of the models used in tora tora tora. i found your info in part one very useful. I design cardstock model ships and have done the Shigure (destroyer) and Jintsu (light cruiser). Photos are on my CoatneyHistory webpage. Others are on my tripod.com webpage. All the photos I have are found in the post, I don't hold anything back. I wouldn't mind seeing some construction photos myself, but they are very hard to come by, I dont think anybody thought at the time that it was worth documenting the model build, though they definitely documented the shooting process. Interestingly, the Myoko-class CAs were originally designed with three funnels. In today's standard It will be easy to make a historical movie like this. Yet Tora Tora Tora is still the best. The Pearl Harbor movie of Jerry Brucheimer is a crap!! I hope Speilberg do a film about the attack which is accurately done and even the battle of midway perhaps. I have read a few articles about the disposition of Hollywood props and miniatures. Many of these models were sold for 10% or less than what it cost to make them. Some are in museums and i woul dguess some are in private hands. Incredible work and an incredible movie. If only the movie Midway had been as good. I first viewed Tora, Tora Tora the second night after it's premier with my father and brother in Honolulu, Hawaii, it seemed like the whole theater audience was crying, sniffling and walking out and back in through the entire movie. Maybe the ship scenes with the models were a little hokie by today's standards, but in that audience that night they were as real as any 9 y/o could imagine. My father took my brother and I to the USS Arizona Memorial two days afterward, in the several times I've been back to the Memorial I've never spent as much time on it as that first time in 1970. A few of the Japanese ship models are in the recently closed Armed Forces History Museum located in Largo Florida off of Ulmerton Road. Unfortunately the museum could not make a go of it financially and closed at the end of January 2017. Would anyone have a detailed listing of the crew who did the models? I am looking for missing family member who I was told worked on this movie and several others with similar war models. Thanks! On row 8 there are four images of miniature warships that are attributed to "Tora Tora Tora". 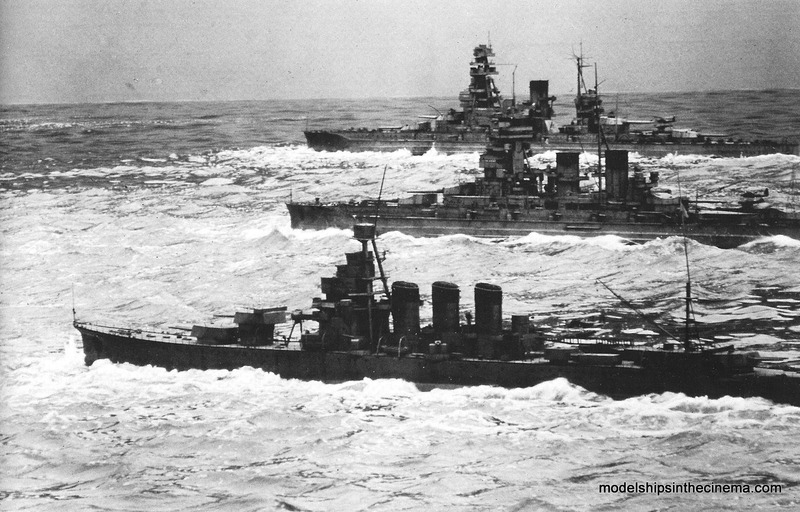 "THE SHIPS OF TORA! TORA! TORA!" p274 910. SUBMARINE FILMING MINIATURE FROM TORA! TORA! TORA! "Authentically-detailed sculpted wooden and metal miniature model of a Japanese submarine, 40 in. x 11 ½ in., which appears near the beginning of Tora! Tora! Tora!, the highly authentic film treatment of the Japanese invasion of Pearl Harbor. We see the submarine crew, far ahead of the general invasion force, attempt to follow an American destroyer into the harbor, only to be shelled and depth-charged to the bottom. All exterior submarine shots are of this miniature, as no actual version was required. Some light wear and handling, though essentially complete and is an impressive display piece. $2,000 – $3,000"
Note: In my previous 'Reply' there seems to be a problem in the sentence 'By the way it was a “Type A K?-hy?teki class” 2 man mini-sub armed with 2 torpedoes'. That "Type A K?-hy?teki class" mess will make more sense when replaced by "Type A Ko-hyoteki" - it seems that the 'Reply' is having trouble with non-standard characters - in particular where the letter 'o' has a horizontal bar over it. It has the same text and images as the "Profiles in History" entry without having to download and troll through a large digital catalog. Also the images can be expanded to full size with just a mouse click. Finally I belated noticed that I yet again fell into the trap of using the paper (p274) rather than the digital (p277) page number. This model is 40 inches/102 cm by 11.5 inches/29 cm. I remember seeing the USS Nevada model on the USS Intrepid museum in 99 or 2000. It was huge, and my goal is to make a large enough model where I can drive inside it. Thanks for this site. Definantly looking for what happened to these models from this great movie. STOP USING CGI AND RETURN TO MODELS!! Although light cruisers like Nagara were. Shigure? A fan of Capt. Hara? I have those pictures bigger from blu-ray if you want them! Just learned today (Aug. 23, 2018 that our museum where I work may be getting one of the Jap destroyers used in "Tora Tora Tora" donated to us.